← Texaco celebrates 100 years in Jamaica! Texaco awarded best gas station in St. Maarten! Sunday January 20th, 2019 – Simpson Bay, St. Maarten. The GB Energy – Texaco Simpson Bay station was awarded the No. 1 best gas station on the island of St. Maarten! 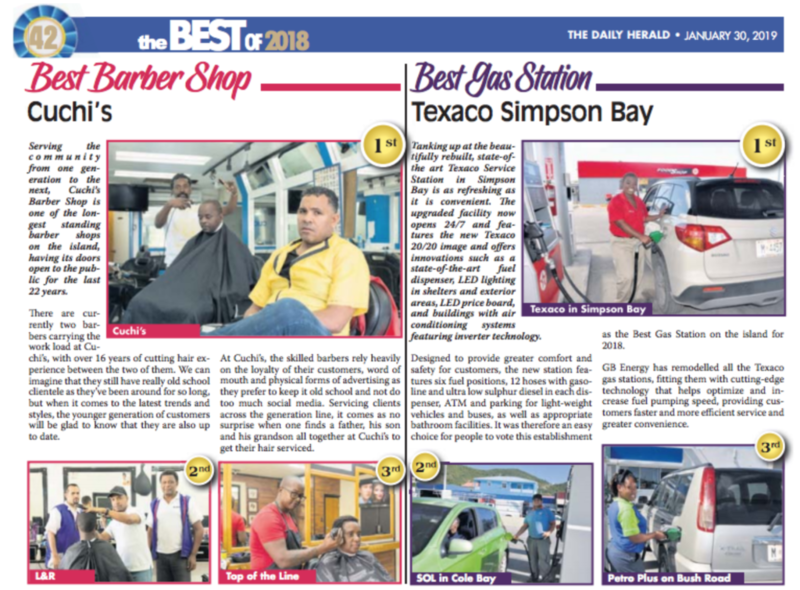 GB Energy – Texaco has just been recognized as THE BEST service station on the entire island by the Daily Herald’s reknowned yearly supplement in which it lists the “BEST OF ST. MAARTEN” in several categories. Filling-up your tank at the beautifully rebuilt Texaco Service Station in Simpson Bay is as refreshing as it is convenient. The upgraded facility opens 24 hours a day, 7 days a week and features the new Texaco 20/20 image. The station features the new Texaco 20/20 image and offers innovations such as a state-of-the-art fuel dispenser, LED lighting in shelters and exterior areas, LED price board, and buildings with air conditioning systems featuring inverter technology. This new station has been designed to provide greater comfort and safety for Texaco customers in St.Maarten. It features 6 fuel positions, 12 hoses with gasoline and Ultra Low Sulphur Diesel in each dispenser, atm and parking for light-weight vehicles and buses, as well as appropriate bathroom facilities. After arriving in the St. Maarten in 2012, GB Energy has remodeled all the Texaco gas stations, fitting them with cutting-edge technology that helps optimize and increase fuel pumping speed, and provides customers faster and more efficient service, as well as greater convenience in its facilities. In addition to the company’s initiative to modernize gas stations, innovation has allowed GB Energy to become a leading company in the country. This humbling recognition reaffirms GB Energy’s commitment with the Texaco brand in St. Maarten as well as our vision to: continue making a difference in our community, maintaining our position as market leaders in the region’s fuel market, growing the business sustainably and committing to our customers’ expectations.